To carve a fowl, separate first the wings and legs and thighs. Then cut slices from both sides of the breast, as in the figure C to B. Make an opening in the turkey for the purpose of serving the dressing. (See A.) Serve the breast, thighs and wings first, with dressing added, leaving the back till the last. All fowls, partridges, and grouse, are served in the same way. When helping to gravy, do not pour it over the meat, but put it on one side of the plate, to be used by the guest as best preferred. Small birds, as quails, woodcock and pigeons, are split down the back and a half given to each person. It soon becomes easy to acquire a knowledge of joints, and any one can become an expert who tries to learn the relative position of the bones and joints. A quiet demeanor and a cool head are essential to success. Used for porter-house and sirloin roasts and steaks. Aitch-bone, used for boiling and pot roasts. Buttock, used for round steaks and boiling. Round, used for corned beef and stewing. Shin, used for soups and croquettes. Flank, fine for boiling or drying. Used for corned beef and for pressed meats. The fore-ribs, considered the best piece for roasting; also makes the finest steaks. 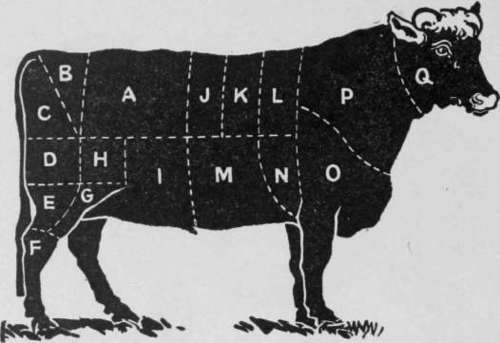 Middle ribs, four in number, used for rib roasting. Chuck ribs, second quality of roasts and steaks. Brisket, used for corned beef, mince-meat, soups and spiced beef. Shoulder-piece, used for stews, soups and hashes. Neck, used for consommes, soups, mince-meat, sausages, etc. Cheek, good roasted; head and all. Of the head the tongue only is used. The finest mutton for table use is what is known as the South Down. The South Down wether is the choicest meat found in the city markets. Lamb born in the fall, well sheltered, and fed mostly upon milk, when killed in the Spring, is considered a great delicacy. Like all young animals, lamb should be thoroughly cooked. 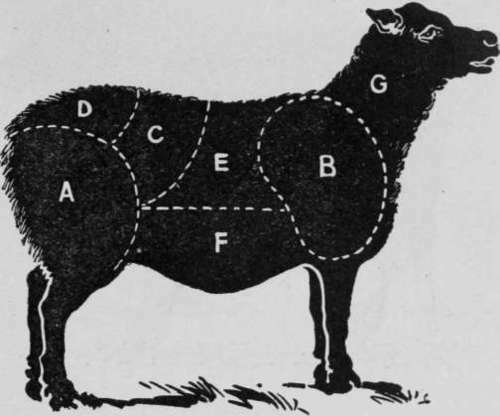 Mutton is generally split down the back and each half is cut into two parts, called the hind and fore-quarters. 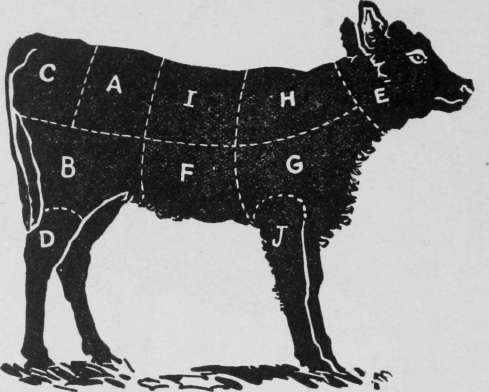 A saddle of mutton is the middle portion before the quartering is done. Leg, used for chops and roasts. Shoulder, used for baking and stews. Loin, used for roasts and chops. Loin, from which are taken the second-best chops. Rib chops, used either for frying or boiling. Breast, used for roasting or boiling. Neck, used for cutlets, broths and meat-pies. In cutting up veal, the hind-quarter is divided into loin and leg, and the fore-quarter into breast, neck and shoulder. Loin, the finest cut for roasts and chops. Fillet, for roasts and cutlets. Rump-end, used for roasts and cutlets. Knuckle, used for stews, soups, mince-meat. Neck, used for stock, stews and hashes. Breast, used for roasting and chops. Blade-bone, used for pot-roasts and stews. Fore-knuckle, used for soups and pot-pies. Same as D in hind-quarter. 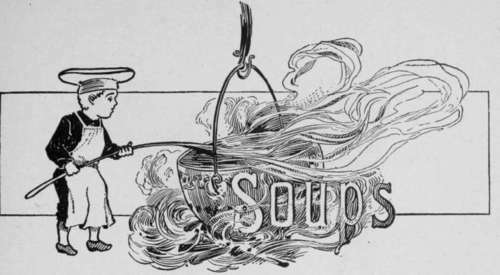 A GREAT French authority on cooking says that soup bears the same relation to the dinner that a doorway bears to a house, and, it is safe to say, too, that no other dish is capable of such variation, and none has received so much attention from the cooks of all ages and all nationalities. There are at present about two hundred and ninety different kinds. When made of good material and in a proper manner, they are more nourishing than almost any other kind of food. Delightful And Appetizing Dishes For Dinner. 1. Mrs. Horner's Individual Chicken Pies. 2. Pickled Onions - Swedish Recipe. 3. Grape Jelly - New Hampshire Recipe. 4. Mrs. Earle's Fish Croquettes. 5. Mrs. B. 's Blueberry Cake. 6. Dressed Radishes and Celery. (Club Style). 7. Stuffed Olives - Delicious and Appetizing. The turnpike road to people's hearts I find. Lies through their mouths, or I mistake mankind - Dr. Wolcot. 1. White Mountain Cream Puffs. 3. Miss Stahl's Quince Souffle. 4. Honey a la New York. 6. Sliced Lemon Pie - Meringue Dressing. 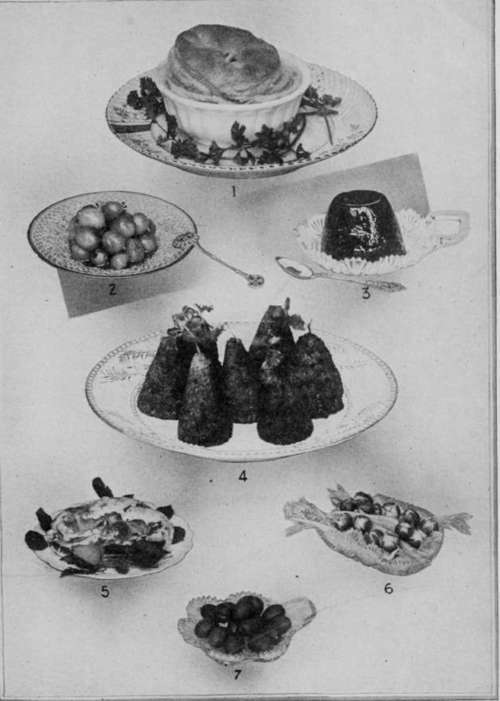 Soups are divided into two kinds - meat and vegetable. As the latter properly belong to Part II., only soups with meats will be found under this heading. In the making of meat soups, it is a matter of taste as to what portion of the beef shall be selected for making them. Some housekeepers prefer the shin bone, as it contains the marrow, which adds strength and thickness to the soup, while others like the neck, as that makes a more nutritious soup. There are three classes of soup - clear, thick and purees. The first is clear and thin; the second, about as thick as cream but not transparent, while in a puree, all the ingredients entering into its composition, are rubbed through a sieve. The flesh of old animals contains greater flavor than does the flesh of the young ones, while dark meat contains more than white meat. Rub the yolks of four hard-boiled eggs with a little melted butter, to a paste. Add a little pepper and salt. Beat two raw eggs and add to above, with flour enough to make them hold together. Make into balls, put in soup and let boil one minute. Mrs. E. Brown. Toast bread crusts in front of a very small fire, and on a wire toaster. 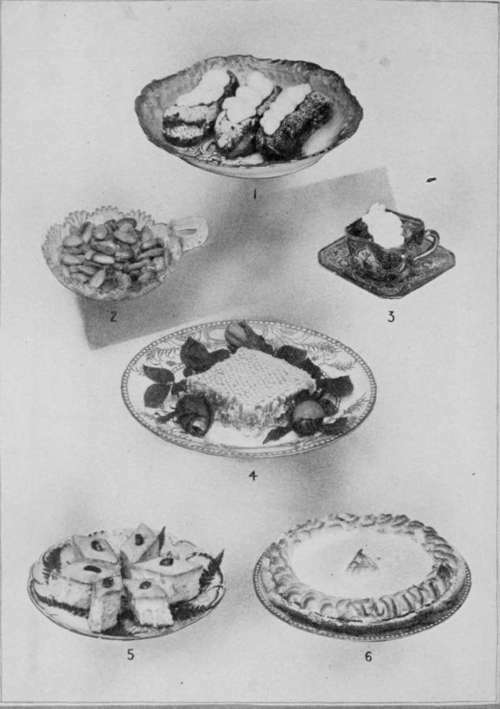 When brown on both sides, cut the bread into very small dice before serving. Untoasted bread swells, and is likely to spoil the appearance of the soup. Mamie Allen. It is not always possible to obtain fresh herbs, and so, a good way to obtain a flavoring for soups is to procure them in season fresh, just before they begin to flower; dry them in a warm, but not hot, oven; pound them fine and pass through a wire sieve. The powder should then be put into small bottles, stoppered closely, and kept dry. The proportions are as follows: Two ounces of sweet marjoram, two ounces of winter savory, two ounces of dried parsely, two ounces of thyme, half an ounce of bay-leaves, a quarter of an ounce of celery-seed, an ounce of sweet basil, and an ounce of lemon-peel. A. W. Cutter.